DIOR have spoiled us with new innovation lately, and it doesn’t look like they’re stopping anytime soon! 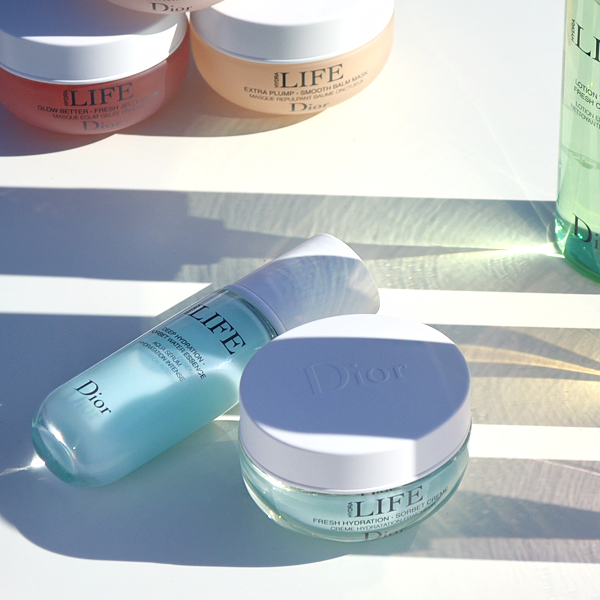 Because for Spring 2017, DIOR has unveiled their latest skincare franchise, Hydra Life; a skincare range that’s all about, yes you guessed it – hydration. But hydration is just the beginning of the Hydra Life story. You didn’t think DIOR would leave it there, did you? Hydra Life combines minimalist formulas with optimal efficacy and environmentally responsible packaging (eliminating leaflets, corrugated cardboard and cellophane), and the result is skincare that feels and works just as good as it looks. 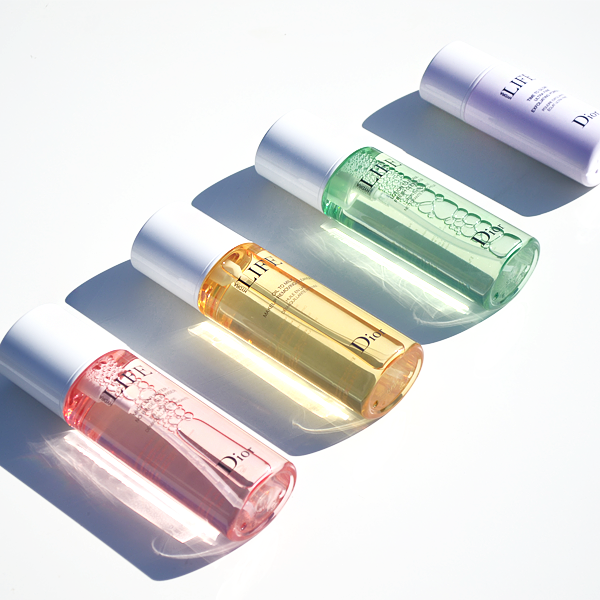 The DIOR Hydra Life cleanser collection is an irresistible fusion of minimalism and luxury. Simple yet chic the packaging alone got me curious, but it was the transformative textures that really sealed the deal. Crafted with only essential ingredients, the ultra-gentle formulas will exfoliate, purify and cleanse the skin. If you love your skin to feel squeaky clean then this is for you! The DIOR Hydra Life Lotion To Foam Fresh Cleanser transforms into an airy foam in just one pump and lifts all traces of dirt and makeup from the skin. Highly concentrated in white tea leaf extract, the skin-pampering foam cleanser will purify, tone and refresh the skin, leaving it perfectly prepped for the next phase of your skincare routine. Like your makeup removal routine to be quick and easy? Look no further than the DIOR Hydra Life Oil to Milk Makeup Removing Cleanser. This highly effective makeup removing oil transforms into a rich and creamy emulsion upon contact with water, breaking down (even waterproof) makeup and dirt so that it easily rinses away. Infused with sweet almond oil, the lavish oil provides a deep cleansing action that is perfect for all skin types. And unlike other oil cleansers, it doesn’t leave behind an oily residue – only skin that is velvety and fresh! Whether you’re constantly on-the-go or want to avoid using tap water, a micellar water is a perfect alternative. Better yet, the DIOR Hydra Life Micellar Water No Rinse Cleanser is the perfect alternative. Enriched with Echinacea flower extract and powerful micelles, the calming micellar water traps all impurities and removes makeup from the face and eyes in a single step. It’s easy cleansing with no compromise on effectiveness! If you love exfoliators, you’ll absolutely adore the DIOR Hydra Life Time To Glow Ultra Fine Exfoliating Powder, because it’s a super exfoliator! A powder that turns into a foam, the formula contains sugar extract to refine the skin’s texture, as well as lotus seed to polish the skin’s surface. Upon contact with water, the powder turns into a light foam that deeply cleanses the skin, helping to reveal the natural glow of your complexion. The result? Skin that is clarified, smooth and radiant. 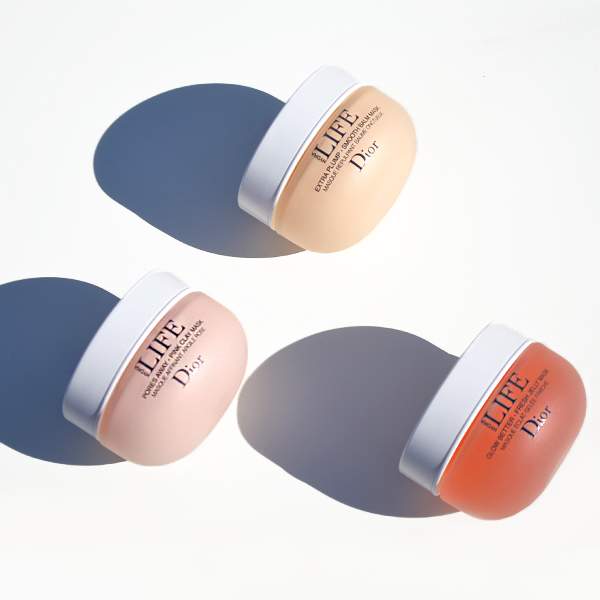 This jelly-textured mask is the ultimate radiance boost! Ideal for dull skin types in need of brightening, this water-rich gel melts into the skin and offers a dual scrub action that is both gentle and powerful. Citrus fruit extracts are first up, working to remove dead skin cells under the surface, while apricot kernel extracts work on the skin’s surface to buff and smooth, leaving skin energised and revitalised. 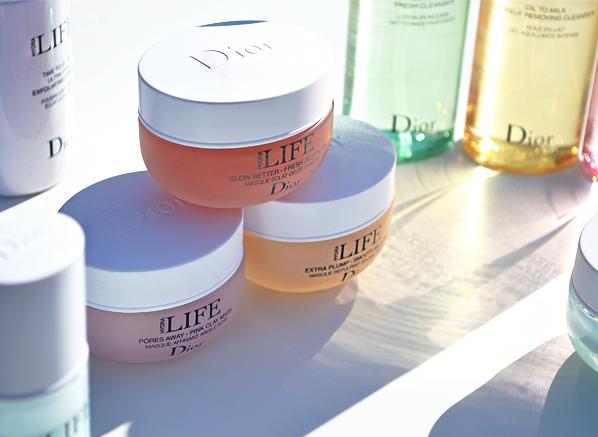 The DIOR Hydra Life Extra Plump Smooth Balm Mask is like a big hug for the skin, cocooning it in a dose of nourishment. Perfect for those looking to get their bounce back, the balm mask contains white pine oil and natural plumping agents, which leave skin plumped, smooth and comfortable day-after-day. Problem with pores? Not anymore! The DIOR Hydra Life Pores Away Pink Clay Mask is air-whipped, creamy and has a natural pink colour. The lavish formula refines the complexion, minimises the appearance of pores and mattifies the skin. How? Well, that’s thanks to natural minerals and jojoba extract, which rebalance and purify, leaving the complexion super fresh. In line with the Hydra Life story, this hydrating duo is all about naturally beautiful skin. Infused with the best of nature, the Hydra Life Sorbet Water Essence and Sorbet Creme are designed to keep skin full of moisture throughout the day. Made for those that want healthy, happy skin, this duo will ensure your complexion looks nothing short of fresh and radiant day-after-day. Designed to boost skin hydration, the DIOR Hydra Life Deep Hydration Sorbet Water Essence is like a big drink of water for the skin. Concentrated in mallow and haberlea leaf, this lightweight essence offers a 3-in-1 action: the moisturising power of a serum, the radiance boost of a gentle peel and the the toning effect of a lotion. With a blue liquid texture, the Sorbet Water Essence will instantly invigorate and reinforce the skin’s balance. Nobody wants dehydrated skin, that’s why DIOR have unveiled the DIOR Hydra Life Fresh Hydration Sorbet Creme. The ultra-fresh lightweight yet nourishing creme offers 24-hour hydration and is infused with mauve and laberlea leaf, which rebalances, nourishes and moisturises the skin in one. The gel texture will instantly refresh skin, while the innovative formula will help to keep it strong, healthy and beautiful every day. This entry was posted on Tuesday, April 11th, 2017 at 9:25 am and is filed under Brand Focus, New products, Skincare, Spotlight On. You can follow any responses to this entry through the RSS 2.0 feed. You can skip to the end and leave a response. Pinging is currently not allowed.